Herald: Being in the ISL draft for the first time, did you expect you would be picked by FC Goa? MOHAMMED Ali: Getting in the draft was my first step towards ISL. I had hopes on the four teams –FC Goa, NorthEast, TATA and Mumbai City FC, as I had a word with them and they were pretty interested in me. 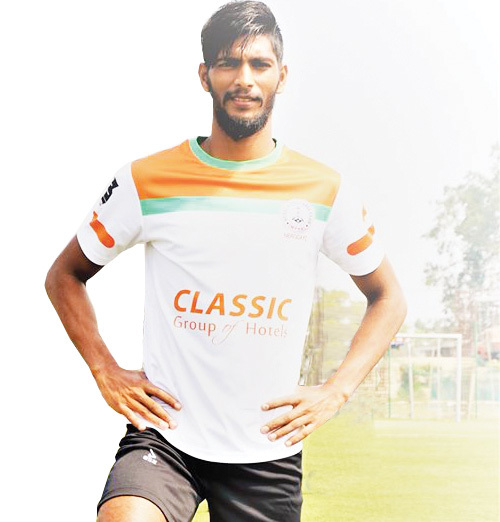 Honestly speaking I had a positive that I would be chosen by FC Goa as most of them have seen me playing including assistant coach Derrick Pereira, who knew my playing style and technique. I always imagined being part of the team and hoped of getting the opportunity to prove myself. I had always wished to play for my home club and I’m sure that every player in Goa has that dream to get there. I found myself lucky to be picked by the Gaurs. H: What was running through your mind when found that you weren’t picked by any team in the first nine rounds? MA: I was very nervous two days before the ISL draft as it was my first time for the top league. I was just counting the players picked by the teams and keeping hopes alive during the draft. I made myself strong that some or the other team would pick me. I had faith in myself and god. I was quite positive that I would make it through and was praying hard as my mind was getting diverted by the negative thoughts. H: You were a mainstay in Dempo SC’s defence and were influential in guiding the five-time national champions back into the I-League. What you have say about it? mA: Dempo SC gave me a perfect opportunity and platform to showcase my talent. Coach Maurice Afonso showed his belief in me as he played me in all the second division I-League matches. This was the perfect opportunity for me to make my presence felt in the Indian football and I managed to do it. Being a defender I always gave my 100 per cent on field to get my team promoted to the next level. I then played for Neroca FC where I managed to repeat the feat. Hard work always pays off, it never goes in vain. I tried to make the best use of the opportunities that came into my way and I shall continue to do so. H: You played alongside few FC Goa players like Mandar, Kattimanni earlier. Do you think this can be a morale boost to you? MA: I have been playing with Dempo SC for the past two seasons along with Mandar, Kattimnao, Debu and Romeo. We all shared some good understanding with each other. And having Mandar and Katti in the same team will make me even more comfortable and help settle in the team easier. Having few of my earlier teammates in FC Goa is a plus point for me and the team, as this will build our on field chemistry. And yes for ISL if given playing time, it will be no less and will give my heart and soul for this season. H: What was the feeling and atmosphere at home when FC Goa picked you in Round10? MA: When FC Goa picked me, I was all filled with emotions. The minute they took my name, I looked at my mother who was sitting besides me the entire draft session. She had tears of joy in her eyes. This is what she had been waiting for all these years. And not to forget my friends, who literally danced in the hall. I could see the feeling of happiness in everyone at home. H: Now that you have crossed the first hurdle, what are your plans with the club? MA: All that I wanted was one chance to prove myself. I will not let down FC Goa this season. I will make sure that they do not regret signing me. Plans are to play hard as a team and get a successful season this year. H: FC Goa had a poor campaign last season. What do you look ahead as a defender in the upcoming season? MA: Being a defender I will make sure that this year the mistakes are not repeated in the defensive zone. I will try to give more than 100 per cent on the field. And yes, this can be attainable along with my fellow teammates.